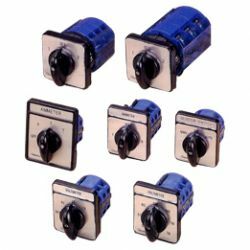 CAMSCO, as professional and well-developed manufacturers of cam switch, rotary cam switches, voltmeter switches and ammeter switches since 197, our rotary switches through meticulous produced are quite durable. Please click on the following pictures for more specific information of our products. Silver alloy & sliding contacts ensure reliable & accurate operation. Complied with EN60947, VDE-0660 IEC-947. Rear wiring allow work easy. Contact Rating: 16A 300VAC/ 32A 600 VAC.